I finally got a chance to use one of my new Kenny K digi stamps I bought a few weeks ago. I am quite happy with the way it turned out. I've bought quite a few digi stamps recently, from a few different places. It's nice because you can shop around the world and have your image immediately. Here is the card I made with Racy Roxie from Kenny K.
For this card I used black and crimson bazzill card stock. 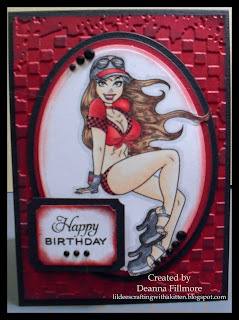 The crimson is embossed with the Tim Holtz checkerboard embossing folder and inked up with versa magic black chalk ink. I printed the image on white copic paper and colored her in with copics (R24, R27, R29, E21, E25, E29, E000, E00, E01, BG13, N1, N3, N5 & 0), black prisma marker & Rhubarb memento marker. I used spellbinders petite ovals large & small. She was a little to big so I had to use the Out of the Box (follow link for a tutorial) technique to cut her out. The greeting block is cut with spellbinders large & small labels and the greeting is from flourishes "tag lines" stamp set. I inked around edges with Tim Holtz aged mahogany. It needed a little more embellishment so I added some black rhinestones to finish it off. I have another card to post and I will probably add it tonight, but right now I want to go make some more cards. I will post again later tonight or tomorrow. Happy Spring everyone.